Ju, Tzong-Ching, the well-known percussionist, who has played a significant role in enhancing the wide interest in percussion music in Taiwan over the last three decades, and the popularity of percussion music in Taiwan owes a great deal to Ju for his pioneering efforts in music education. Upon graduating from the National Taiwan Academy of the Arts (now known as National Taiwan University of Arts), he continued his percussion studies at Hochschule fur Musik und Darstellende Kunst in Vienna with Walter Veigl and Richard Hochrainer, former principal percussionist of the Wiener Philharmoniker. He was the first Chinese who received the diploma of Music Performer in percussion in 1982. Upon returning to Taiwan, he served as the principal percussionist of the Taiwan Symphony Orchestra. He founded Taiwan’s first percussion ensemble, the Ju Percussion Group (JPG), in 1986. Three years later, the Ju Percussion Group Foundation was formed to manage JPG’s administrative affairs. In 1991, he established the Ju Percussion Music School, the first domestically developed percussion education system to promote the percussive arts in Taiwan. In 1993, he organized the Taiwan International Percussion Convention (TIPC). The successful events held every 3 years introduced the most avant-garde trend of percussion art in the world to Taiwan. In 1999, he founded the Taipei International Percussion Summer Camp (TIPSC), giving an opportunity for percussion students to expand their musical visions and enrich their percussion educations. In 2005, Ju received his Executive Master of Business Administration degree from the National Taiwan University. 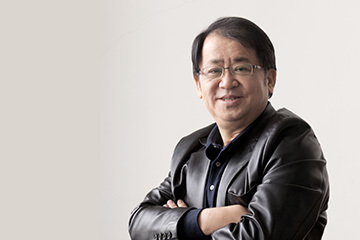 Hu has been served as the Director of National Taiwan Symphony Orchestra, the Director and the Chairman of the Board of National Theatre and National Concert Hall (NTCH), the Principal of Taipei National University of the Arts (TNUA). In 2009, he was the General Director of the Opening /Closing Ceremony for the World Games Kaohsiung. For his artistic excellence, he has received numerous honors including the National Award for Arts and the Presidential Order of Brilliant Star with Violet Grand Cordon. In 2016, he has been inducted by the Percussive Arts Society (PAS) into its Hall of Fame. In 2017, he was the Honorary Doctorate recipient of the Taipei National University of Arts (TNUA). At present, he is the Artistic Director of Ju Percussion Group, Chairman of National Performing Arts Center, Chair Professor of Taipei National University of the Arts (TNUA), and Emeritus Professor of Nation Taiwan University of Arts (NTUA).